Google Home owners now have access to CNN through the first Action that delivers topic-based TV coverage in near-real time on the device. The CNN “Action” features audio news straight from CNN’s world-class anchors and reporters around the globe. Content from the likes of Anderson Cooper, Wolf Blitzer, and John King are available as soon as 5 minutes after broadcast. The Action helps users quickly discover the latest stories CNN is covering and dive into any one of them for CNN’s full broadcast audio coverage powered by CNNgo. 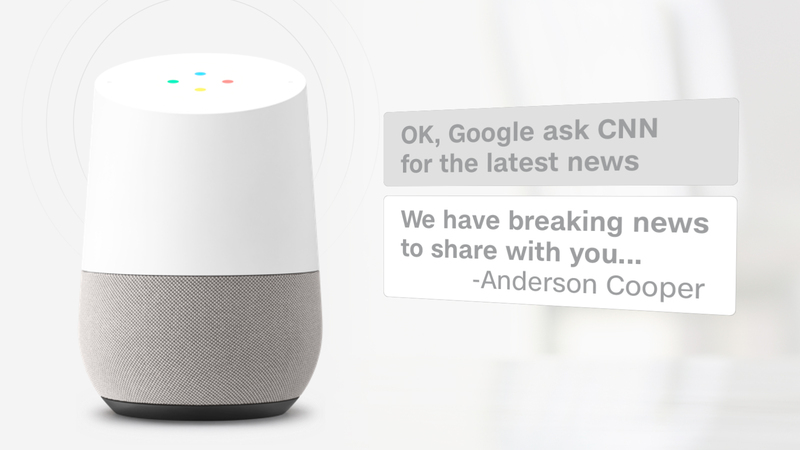 The new action compliments CNN’s previously launched Narrated News on Google Home, which features a daily morning and evening audio news briefing on the latest headlines in three minutes or less. CNNgo is a next-generation product that gives viewers unprecedented control over their TV news experience, and is also available on Amazon Alexa, CNN.com, CNN’s iPad app and on Apple TV, Roku and Amazon Fire TV.